Choose from a wide range of Walking Stick products by Exclusive Furniture World. Crow on skull handle walking stick, 99cm from tip to handle top. Main shaft of tapered round section..
Black walking stick with silver Dog handle design. Measurements W: 10cm, D: 3cm, H: 98cm.Features a ..
Black walking stick with silver Dolphin handle design. Measurements W: 14cm, D: 5cm, H: 96.5cm. Feat..
Dragon handle walking stick, 97cm from tip to handle. Main shaft of tapered round section wood with .. Golf ball head walking stick, 92cm from tip to handle top. Main shaft of tapered round section wood ..
Black walking stick with silver Lion handle design. Measurements W: 12.5cm, D: 3cm, H: 94.5cm. 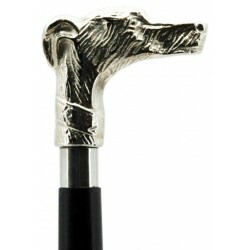 Featu..
Black walking stick with silver Rabbit handle design. Measurements W: 13cm, D: 4cm, H: 95cm. F..
Black walking stick with silver Skull Head handle design. Measurements W: 7cm, D: 5cm, H: 95cm. Feat..
Black walking stick with silver Snake handle design. Measurements W: 8cm, D: 2.5cm, H: 103cm. Featur..